Under the Economic Growth, Regulatory Relief and Consumer Protection Act, credit freezes are free of charge to anybody, regardless of whether or not they are victims of identity theft. This new law requires credit-reporting agencies to eliminate the cost of credit freezes, credit unfreezes (thaws) and yearlong fraud alerts to consumers. Website Required: The three major credit bureaus, Equifax, TransUnion, and Experian must design a website, where consumers can go to request this credit protection. The sites must also provide the ability to opt-out of receiving solicitations in the mail for insurance or credit card approval. Protection for Children: The act allows guardians to request on behalf of children younger than 16 years old to freeze their credit. Military Credit Offers: Members of the military with access to active duty alerts can request to remove their name from prescreened credit card offers for two years. Why Should You Consider a Credit Freeze? They odds are slim and assume it won’t happen to them. They don’t have much money in their bank accounts to steal. They don’t have credit cards and assume this means they don’t have a credit history. They don’t have a poor credit history and believe a scammer will not benefit from having their information. These arguments do NOT prevent bad actors from opening accounts using your information. The main concern is not the money you have but whether new accounts can be open without your knowledge, or consent. Issuing a credit freeze essentially stops any credit-reporting agency from reporting your credit score or credit report to a lender. Credit reports help lenders decide whether or not to extend a line of credit or grant loans to consumers. Often, without the ability to see the credit report, lenders will deny the credit line or loan, therefore protecting the consumer from unwanted accounts in their name. Concerned that you may seek a line of credit in the future?—The thaw can help with that. You can contact the company before you plan to take on a new line of credit and lift the freeze temporarily. The credit freeze is the best line of defense against bad actors stealing your information and using it for their own financial gain. 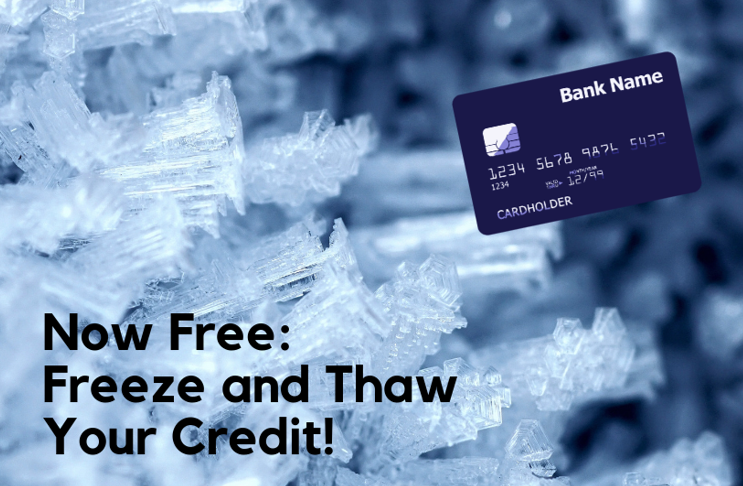 Now that this process is free, anyone can consider placing a credit freeze on their account! For more information about credit freezes or credit fraud alerts, visit FTC.gov or call our consumer helpline at 1-800-649-2424. This entry was posted in Consumer and tagged children, credit, credit bureau, credit freeze, credit report, identity theft, military, thaw, unfreeze by Crystal Baldwin. Bookmark the permalink.